BACK YARD SANCTUARY!! 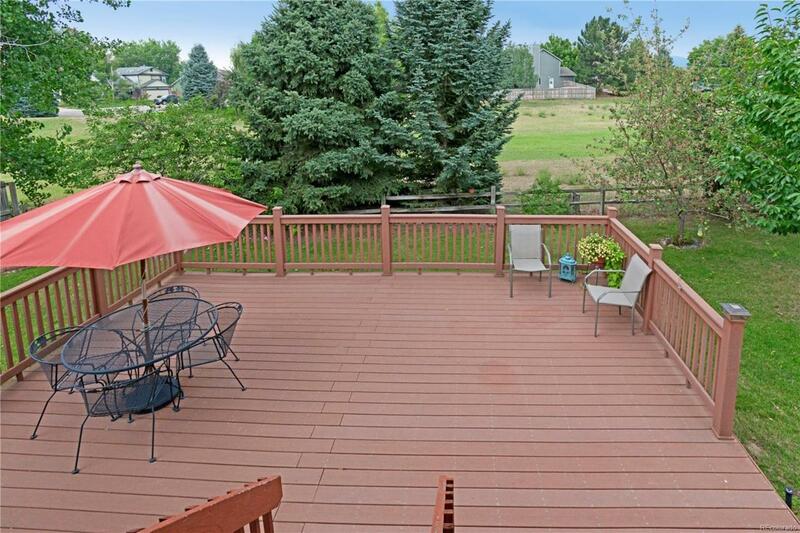 Two huge decks with redwood and Trex, one covered with a skylight, one uncovered; flagstone patio and walk-ways; raised flower beds; automatic sprinklers; privacy fencing; large mature trees and to top it off ... it backs to open space!! Great for entertaining, gardening and relaxing! Just add a fire pit and a Jacuzzi and it's pure paradise! When you enter the open floor plan living room/dining room/kitchen area you will immediately get that warm feeling. Lots of light, a floor-to-ceiling stone fireplace with mantle and hearth, laminate wood floors, granite on the kitchen counters and a nice dining area to gather. Down the hall you will find two bedrooms and a full bathroom. On the lower "garden" level you will find a huge multi-use family room area & another floor-to-ceiling stone fireplace. Off to the side you will find another bedroom, full bath and the laundry/utility room. Absolutely wonderful home! !